Welcome to week 46 in year 4 at PPF! This week the random number generator chose #42 - Karla B. In her art journal this week, Karla was musing about time whilst using her own free time wisely and creatively by painting these lovely and thoughtful pages. Have a fun paint filled week! Lovely pages from Karla today! This post from Karla was great! Karla's journal page is lovely and I love how well it matches the background of the photo!! I love this happy breezy page, very carefree feel! That's a sweet face in the art journal. Blessings! Love Karla's colorful paintings-happy PPF everyone! Great Page! Her nose is so cute. Sorry about the double posting. I accidently hit the one already cookied from a couple weeks ago. Can you delete the first one from your end or tell me how to do it from my end? Karla's painting is delightful!!! Happy PPF! Thanks Eva and Kristin!!! 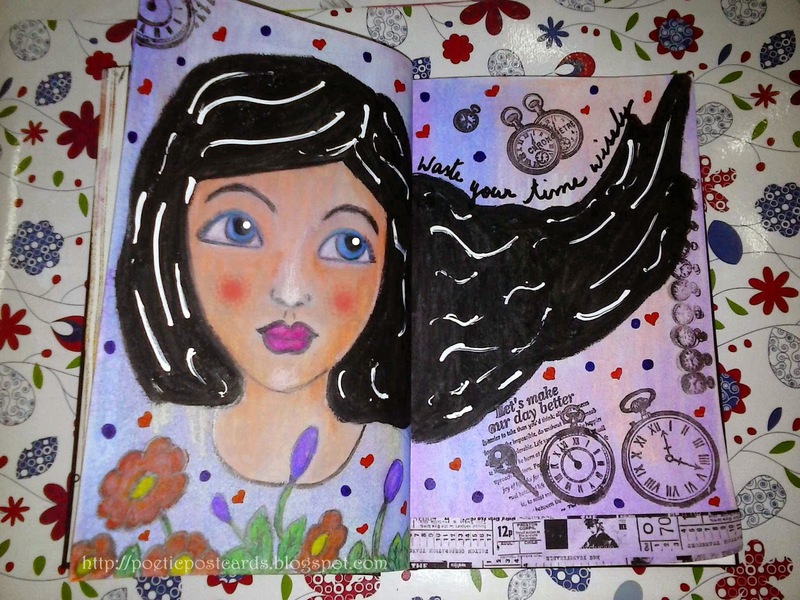 Beautiful art journal page, Karla! Happy PPF! What a lovely piece, Karla! THANK YOU, all who visited my page when I was the featured artist back in November!! I am grateful! Happy 2015, & happy painting! I am honoured!Thanks so much for the sweet surprise! What a sweet and beautiful painting! Happy PPF! Better late than never-happy Friday! Soft and free! Beautiful work, Karla.